Men look set to have a one in two chance of developing cancer in their lifetime, UK experts predict. The increase to 50 out of 100, up from the current 44 in 100 chance, is largely down to people living longer - age is the biggest cancer risk factor, says Cancer Research UK. The cancers set to increase the most in men within the next 15 years are bowel, prostate and skin (melanoma). But more will survive cancer, thanks to better screening and treatments. 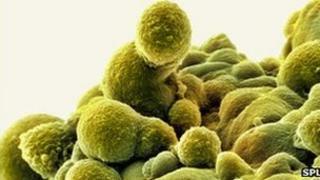 Medical advances mean cancer survival has already doubled in the past 40 years. And with more research, experts believe outcomes could continue to improve. The team from the Wolfson Institute of Preventative Medicine at Queen Mary, University of London, and Cancer Research UK reached their figures by looking at past cancer incidence and mortality rates and projected population data for the UK. They predict that by 2027 some 416,000 UK people are expected to be diagnosed with cancer compared with about 324,000 diagnosed in 2010. For men, the figure will be more than 221,000, up from 164,000 in 2010. And there will be more than 194,000 women diagnosed with cancer in 2027 compared with 160,000 in 2010 - which would mean a woman's lifetime odds of developing cancer would be 44 in 100, up from 40 in 100. Dr Harpal Kumar of Cancer Research UK said the figures provided a glimpse into the future and what challenges lie ahead. A pressing task is to find an effective way to screen for prostate cancer. Not all cancer in the prostate is aggressive or life-threatening - some people live with the condition for a lifetime without any problems. But doctors still have no reliable test that can spot which of these tumours are safe to leave alone. Another challenge is getting men to turn up for cancer screening even when a good test for it does exist, says Alan White, chairman of the Men's Health Forum and professor of men's health at Leeds Metropolitan University. For example, although men tend to be at greater risk of developing bowel cancer than women, relatively fewer men than women go for screening for this cancer, says Prof White. "It's desperately important that men take up any opportunity to go for cancer screening that they can. "Some men are fatalistic about cancer and screening. But screening does make a difference. If cancers are spotted earlier they are easier to treat. "We also know that men who discuss screening with their doctor or their partner are more likely to take up the offer." He said it was important for people to realise that there is a lot we can do ourselves to lower our own cancer risk, including limiting how much alcohol you drink, giving up smoking, getting enough exercise and eating a healthy diet. Experts estimate that about four in every 10 cases of cancer could be avoided in this way. In England, screening is available for bowel, breast and cervical (neck of the womb) cancer. Men can also request medical tests (a prostate specific antigen blood test) if they are concerned about prostate cancer, although these checks are less than perfect.